I discovered the amazing healing power of yoga after an accident involving a dog’s water bowl.Yoga wasn’t part of my life several years ago until one day I accidentally stepped on the dog’s plastic water bowl, skidded along the floor and ended up on the ground in agony. A visit to the doctor and a CT scan later, I found out I had a bulging disc (what used to be called a “slipped disc”) which was pressing against my sciatic nerve, hence the agony. The doctor thought only surgery would fix it but, being rather a coward when it comes to having sharp instruments near my spine, I thought I’d check my other options first. I started a morning routine of gentle yoga stretches specifically for the lower back and the piriformis muscle. It did the trick because within a month or two I could ditch the strong anti-inflammatory drugs I’d been prescribed. That was back in 2004 and I haven’t had a problem since. I’m not saying yoga is the answer for everyone but it worked for me. 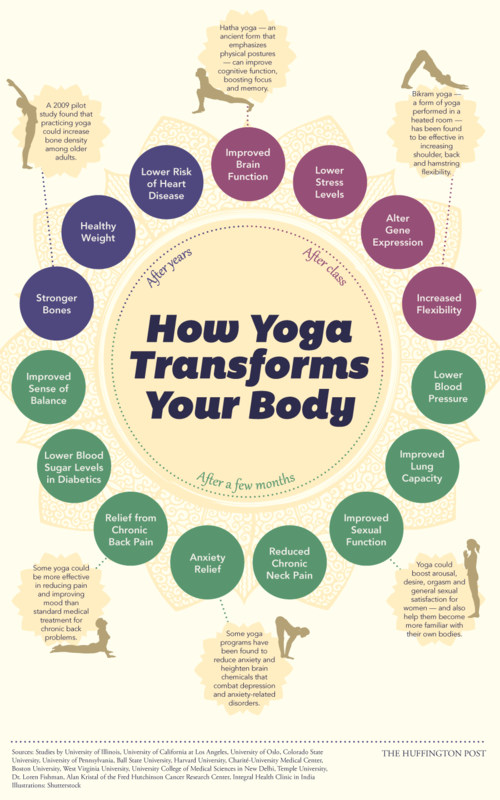 But yoga has a range of other benefits as detailed in the infographic below, courtesy of the Huffington Post, on how yoga can transform your body. Yoga is generally suitable for all ages, but if you have a medical condition talk to your doctor before embarking on a yoga regime. Have you tried yoga? If so, I’d love to know what benefits you found. Feel free to add your comments below.